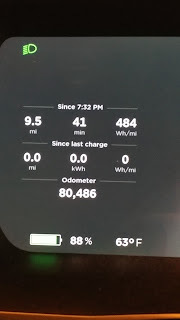 I just wanted to share that my Telsa that I got new on June 24 2015 now has almost 81k. No issue to report. Battery life still good. Did have a door handle fail, that was 910 to get replaced. I am well on track to hit 100k by the time it turns two! I have lost about 6 miles of range according to the computer. And I don't try to be good to the pack. Super charger all the time. And always charge to 90. The CSEVC made it to Cripple Creek's Ice Festival this past Saturday. The weather was fairly warm for February, and while that's bad for ice sculptures it's great for people. The McCauleys passed out free casino food coupons, so everyone got a free meal if they decided they could wait long enough to get to the tables (there were a LOT of people there!). Most of the group got to charge in the small parking lot that has a charger, and a small car show ensued when several of the Model X owners opened their doors to leave - a crowd formed. The UCHealth Grandview Hospital on Nevada Blvd. and I-25 in Colorado Springs, CO has free EV charging. It has two J1772 charging stations and EV reserved parking. The charging rate is 32 amps, 208 volts, approx. 16 miles of range per hour of charge. Congrats to Dan Rosenblatt on his NEW Tesla P100DL. He remains the club member we bet on at Bandimere. We have a small bail money fund set aside for Dan should he run into state or local law enforcement. He is obligated, by the way, to give autonomous driving demonstrations in the future. A close relative attended a AAA (Automobile Association of America) presentation this past weekend and discovered something great - AAA claims to now have the only mobile EV charging service vehicle in Colorado. Despite the sign on the side of the truck below, my relative was ASSURED by AAA that if you have a Tesla, they can charge you at the 80-amp rate. Apparently the truck has a natural gas generator and you get a minimum range/time charge for your call. AAA roadside assistance says you get 15-20 minutes of charge (at 80 amps) per call. AAA was incorrect that they thought that would give you 50-60 miles of range (it won't) but it's good to know that they offer the service. An 80-amp charge will maybe/kinda-sorta give you about ONE mile of range per minute for a Tesla, so the AAA charge is worth about 15 miles. If I got stuck to the point of needing a AAA emergency charge, I think I'd offer the driver some extra $$$ to get another 15 minutes but that's up to each of us. From the photo below, it appears that AAA is using a Clipper Creek EVSE, most likely a J1772 charger. The SAE J1772-2009 connector specification can, indeed, go to 80 amps at the plug. I wanted to make you and the Colorado Springs Electric Vehicle Club aware that the Charge Ahead Colorado EV Infrastructure funding opportunity is now open until February 23rd. This is an effort by the Colorado Energy Office to improve air quality and encourage the deployment of electric vehicles across the state. This grant will fund up to 80% of the cost of EVSE infrastructure, including installation. This funding cycle the Energy Office is working diligently to increase workplace charging throughout the state by having organizations and businesses offer/provide charging for employees through the Colorado Wired Workplaces Program. This program is simply to encourage and promote workplace charging across the state! I would love to provide assistance to any organization through the process of installing workplace charging here in S. Colorado. The DOE Clean Cities Program also has a multitude of resources on their Workplace Charging Challenge Website. Please let me know if you have any questions! Have a wonderful week! ANOTHER small community starts using Tesla batteries to smooth out demand and provide backup. Got Tesla stock? Good for Argentina, Bad for USA?